Most of us have slapped some white paint on a wall without really considering the ins and outs of how to paint a wall properly. As we usually discover later on, the walls are rarely if ever perfectly white. Because like many things, there is an actual skill involved in painting a wall equally white. Tradespeople are paid to do a perfect job, so they have considered all the tiny details that make the job that much easier. And no, it's not just about choosing the whitest white you can find and killing yourself by painting layer after layer. 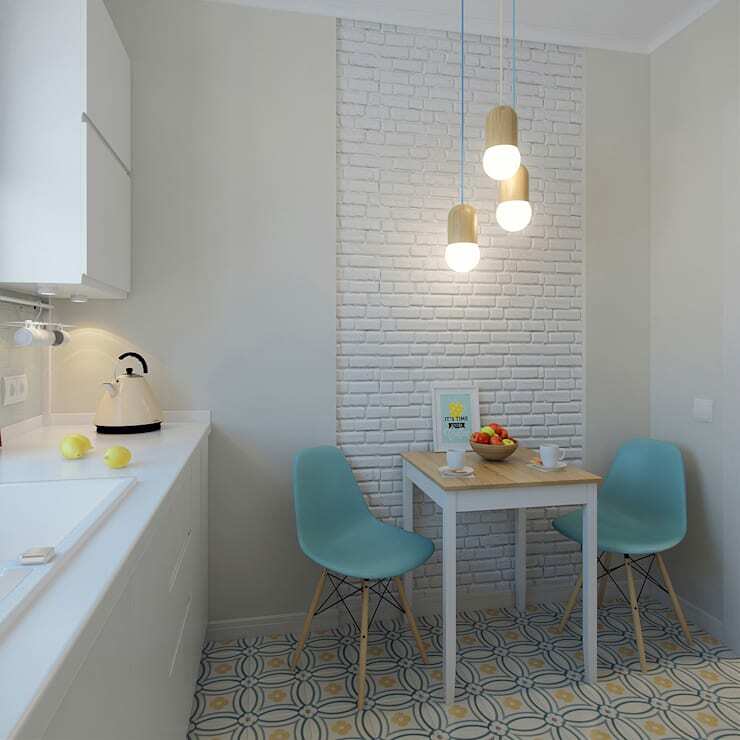 So today on homify we will explore the simplest and most fundamental chore facing many a home renovator. We will cover the best tips to help you create the perfectly painted white room. As usual we will take the opportunity to present a few beautiful interiors. All white of course! 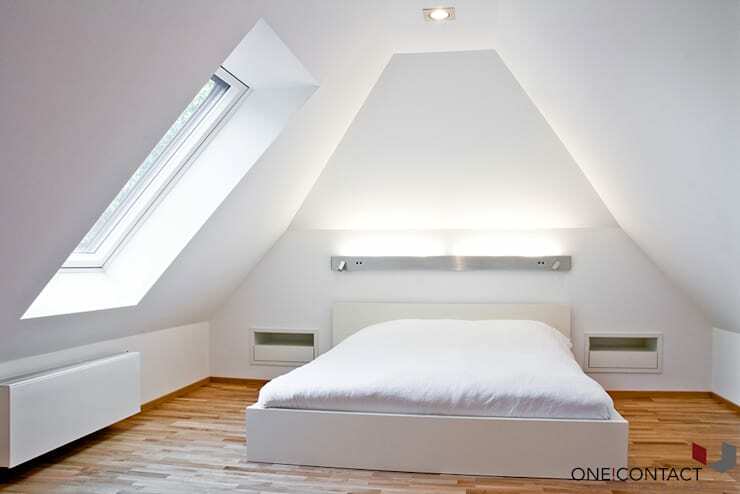 A perfectly white bedroom like this doesn't happen without some serious planning. Before heading out to buy paint, take the time to properly measure your space. It seems completely obvious, but you don't want your half finished wall partially drying while you run out to buy more supplies. Take the length of the longest wall and multiply that measurement by the height of the room. Multiply this figure again by four (this assumes that you have four walls to paint). For the ceilings, take the length of the longest wall and multiply that by the height of the room. Finally, measure up your windows and doors by multiplying the length by the height and subtract this measurements from your total. If you are doing two coats, double these figures. Finally, if you are painting textured or porous surfaces, it's generally a good idea to add another 20 percent to the quantity of the first coat. Once you have your final figure in metres, you can work out how many litres are needed. For conventional paint, you will generally need 1 litre for each 16 square metres of surface area. Every single white is different! What may seem like the purest white on your sample card will quickly reveal sneaky undertones under different light. Even a white bathroom like this may have the tiniest tint of blue. Some recommend looking at sample colours online. While this is generally tricky for other shades, it's a good way to compare the slightest differences in the whites when you can get a bunch of samples up together online. Beware that the slightest tint will appear more intense on the wall. The slightest creamy tint will also be strongly accentuated under certain lighting conditions. Whatever your choice, take the time to think about the emotional response you want to create. A pure white can be very energetic, while the slightest touch of cream will create a more soothing, comforting effect. Some whites may be more suitable for a relaxing bedroom while others may be more suited to a busy kitchen. No matter what room you are painting, it's important to try out at least three different samples in the darkest and lightest areas of the room. Painting materials are a lot more sophisticated these days and make the job far easier than before. A standard sized paint roller is a must. 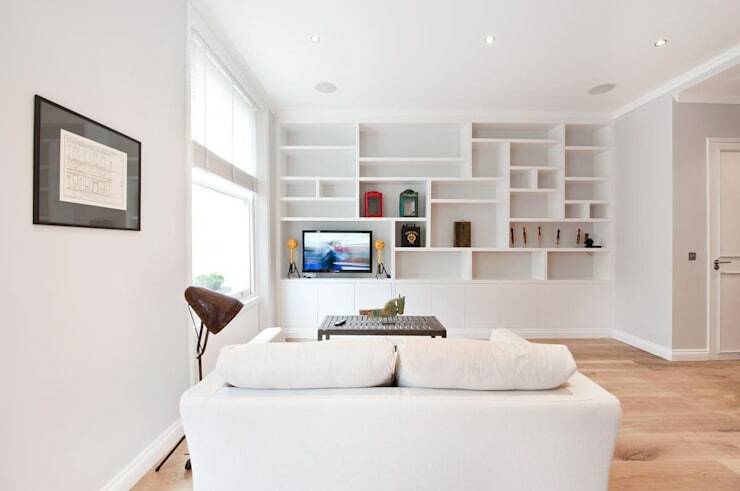 But a smaller one will be helpful for narrow edges like the bookshelves in this all white living room. You can also get small paint accessories in all sorts of configurations to easily apply paint to tricky shaped areas. You'll also need tape, paint tray, paintbrush, utility knife, a spare bucket and a roller screen. Canvas covers for the floor and any furniture is a must. Plastic sheeting tends to get slippery and doesn't soak up spills either. Flexible sponge style sanders are good for getting into the fine detailing and cornices. After you have done your repairs, clean the wall with the material mentioned earlier. 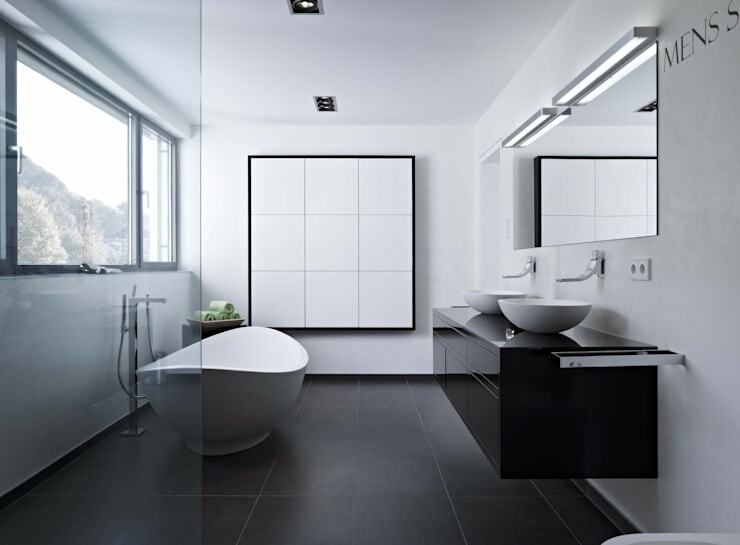 Give particular attention to areas around light switches that are usually touched more often. This is an extremely important part of preparation that should never be skipped. 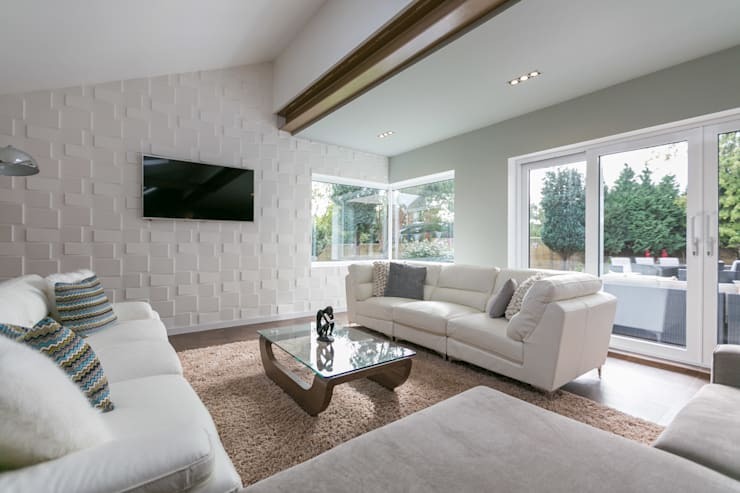 The textured white wall of this living room would need particular care. Then you'll need to repair any marks in the wall. Professional painters use a term called flashing, to describe the shift in cover on a repaired part of the wall. It's easily avoided with a little preparation though. It occurs when little dints or holes in the wall are filled in with porous substances. These tend to absorb more paint than the rest of the wall—resulting in the colour shift. All you need to do is seal these areas properly with a primer paint. The actual texture of this area is likely to be different to the rest of the wall, so apply the primer paint using a roller with a nap that matches the wall. Feather the edges to blend in. Finally, tape up the edges of the trim around the doorways, skirting boards and windows. Every tin of paint will be ever so slightly different, so it's best to mix them together. Try to overestimate how much you'll need for each wall and have the quantity ready to go. Starting a new batch in the middle of the wall will make your white uneven. Plan to start with the skirting boards that you should have already trimmed off with tape. Concentrate on getting a smooth finish and don't worry too much if there's an overlap on the walls. Give it 24 hours to dry, then remove the tape. Do not pull off the tape without cutting it first. The paint will form a fine film between the tape and the wall, so tearing it off will make a jagged edge. Find an inconspicuous corner of the room, cut the edge of the tape with a utility blade, and test by pulling at a 45 degree angle. Next you should paint the ceiling, then the walls. Painting the room in this order makes sense in terms of cleaning up the natural drips that will occur throughout the process. The key to an even finish is avoiding lap marks. Don't apply the paint in sections. Just roll the full height of the wall in a single sweep. Slightly overlap the wet edge when applying the next roll and keep going. The lap marks happen when you apply paint to a dry surface, so keep working in a single working session. Always keep the roller half loaded so it doesn't dry out in the middle of the wall either. But it's hard to keep painting in single strokes like this, particularly when it comes to the ceiling. This is when you need to feather the edges, as in, create thin edges so there's no paint build up when you add the next stroke. Note that a section of brick wall like this will always be a slightly different shade from the plasterboard walls, but it will help to add another layer here because the bricks will be more porous and soak up more paint. We hope this was all helpful and you get a perfectly white wall! If you are interested in redecorating, you'll love this Ideabook: Great ideas of indirect lighting. Do you have any more tips to add? We would love to hear in the comments field below.